I will blog from the Mlearncon in San Jose over the next three days. I have really enjoyed my first day. I’m here as a participant, not as a vendor. At the last 5 or 6 conferences I visited we had a booth at the expo and I had to do one or more presentations. It is a luxury to attend sessions and to network and nothing more. You can follow the conference from a distance, the backchannel is a great source of information. Great work by David Kelly. It will give you a great overview of what is happening here. Mobile Persuasion: Tiny Habits for Big Results. Key-note by BJ Fogg. The grid is made up by 5 types of behavior changes and based on time. 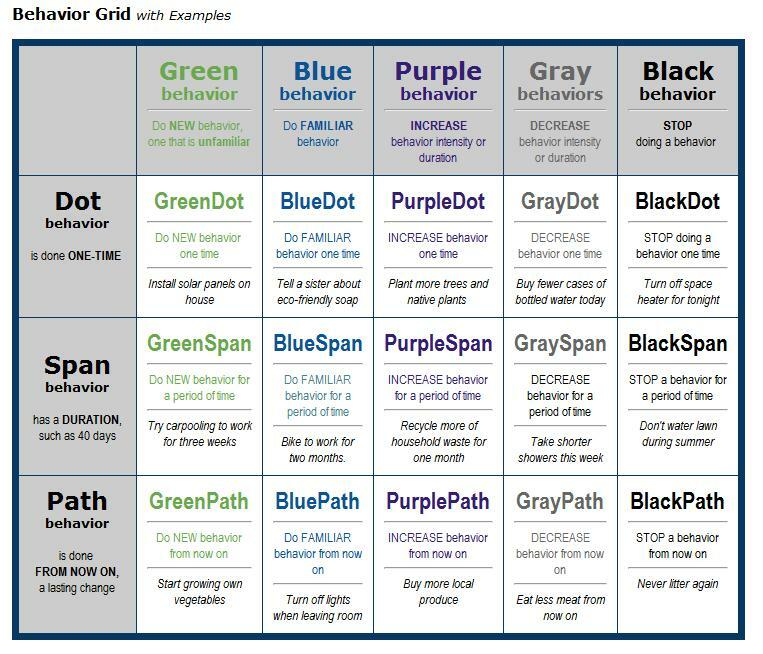 This gives a grid with 15 different ways to change behavior. With Learning you want to establish a permanent change (a path) in behavior. But you should start small and work your way up. You have to create a route from ‘dot’, via ‘span’ to ‘path’ and you should always start with a ‘hot trigger’ something that gets people’s attention. From that you move in small steps move to your targeted change. For example: Trigger, ‘Green dot’, ‘Blue dot’, ‘Blue span’, ‘Blue path’. he used Groupon as an example. They start with a notification on your mobile that triggers you and then step-by-step you are seduced to go further. Before you know it, you will end up installing the mobile app, giving them your mobile number and allowing them to read out your location. His believe that change comes in small steps led to an initiative called tiny change. People can subscribe to this site and express a change they want to implement. You have to fill in the following:” After I ‘existing habit’ I will ‘new habit’. For example ‘After I brush my teeth I will floss’. The existing habit becomes an anchor that will trigger you to perform the new habit. The website will give you feedback on how you are doing. For a lot of people this really works and he uses the data from this initiative to investigate this way of behavioral change deeper. It was a great start of the conference. The grid offers you an interesting basis to design learning interventions. You can read more about his ideas at http://www.behaviorgrid.org . Judy started by pouring out a lot of figures to stress the fast development of the mobile platform. But at the same time (according to comscore) learning or education is not in the top 20 mobile activities. She also stresses that ‘going mobile’ doesn’t mean that you have to put all your current e-Learning courses on mobile. That might work on a tablet, but it will not on a smartphone. There are a whole bunch of activities you can support on a smartphone, but they are more user support like, than ‘classic’ learning. Coach eye. An app that you can use in sports coaching. Unfortunately her presentation is not available for download. If it does come available I will let you know. New mobile experiences built by using the TinCan api. I’m a fan of TinCan (the new SCORM standard that officially released today) but this wasn’t a successful presentation. The idea was to let vendors show pilot solutions they have built with TinCan to prove the added value of TinCan and show their commitment. Unfortunately the internet connection failed, but more important, the audience had little knowledge of TinCan and had tons of basic questions. These questions were addressed in a session later in the day, but I believe a reverse order of sessions would have been better. Dustin described the process of a project they did with a client for (a first) mobile learning implementation. It covers a RFP process. They really struggled with all kind of very basic constraints (like tablets that didn’t have access to the Wi-Fi). They ended up with an android app that they had to install on each android device with a USB stick and they had to use that stick again to get the results from the devices. It did the trick and was succesful but for me this presentation was above all an illustration how far theory and practice can be apart. And that is something we as vendors need to be reminded of every now and then. This was best presentation of the day. There was really a lot of information on why and how to create simulations. There is way too much information to put it in this blog. His presentation is available for download on the MapDeck site (search for Spero). You can download it and take a look for yourself. I will limit myself to a general overview of his presentation. Ken states that learning in corporate environment is about increasing production. Therefore it is about change (again of behavior). People will have to do things different in order to be more effective. He says that experience is the best teacher and that we have to have to expand learning design from instructional design to narrative/experience design in order to give people actual learning experiences. Based on research of Tallheimer and Medina he concludes that simulations are a great way to increase retention, especially when they are part of a spaced learning process. Which is by the way another point: Mobile learning and scenarios are just extra tools in our tool set. And we have to use them in combination with all the other options. They are not a solution for everything, but a part of the solution. He has some great check list in his presentation, check out the ones on audience and learning objective characteristics (slide 21 and 22), his eight points on experience design are also valuable. On top of this he had also the quote of the day: “Good judgment is the result of experience, experience is the result of bad judgment”.